In this video, we'll discuss how students can mentally prepare themselves for the big day and then look back on their work. Now students will turn their outline into a storyboard and (pending your approval) move on to building their actual slides! After watching excellent speakers, students will outline their presentation. Giving presentations is scary, difficult, and rarely taught. 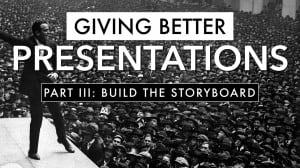 Help your students become better public speakers by first watching the greats and taking careful notes.